Development of This war of Mine Cost Covered in Two Days! This War of Mine is a game that presents gamers a unique view of war that they may not be used to. Trading the QTEs and all action plot for a grim reflection on the damage that war can cause. However, dispite its depresing themes, developer 11 Bit Studios has announced that the game sold enough copies within 48 hours of release to cover all development costs. 11 Bit reveaped this in an infographic along with other facts and statistics. 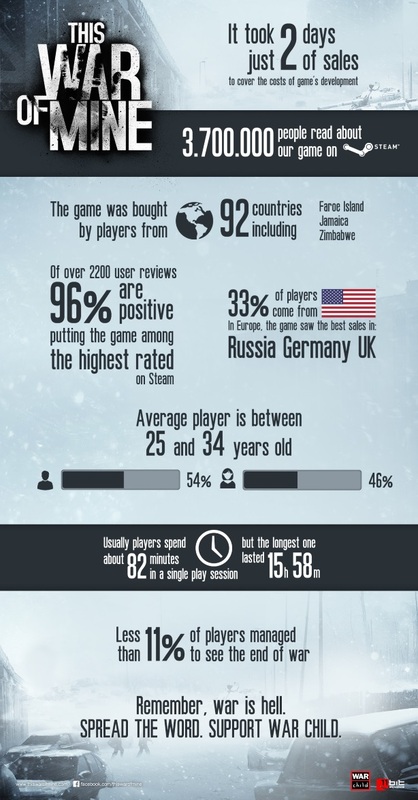 For example, according to 11 Bit, 33% of players come from Europe, and a single player game session lasts 82 minutes, the longest lasting 15 hours and 52 minutes. Check the source below to see the infographic.